Military service in Eritrea to be shortened to 18 months only. Bennett: The illegal infiltrators must return to their homes. Eritrea has decided that mandatory military service in the country will last for no longer than 18 months, Reuters reported on Monday. The report cited relatives of the latest batch of recruits to Eritrea’s national service, who said their relatives had been informed of the decision. Eritrea introduced mandatory 18-month national service for 18 to 50-year-olds in 1995, two years after seceding from Ethiopia, to help in the reconstruction effort following a 30-year liberation war. The duty initially comprised of six months military training, then a year of working on development projects, but the country then changed the policy so that national service is unlimited. That policy has been in effect ever since a two-year border war broke out with Ethiopia in 1998. 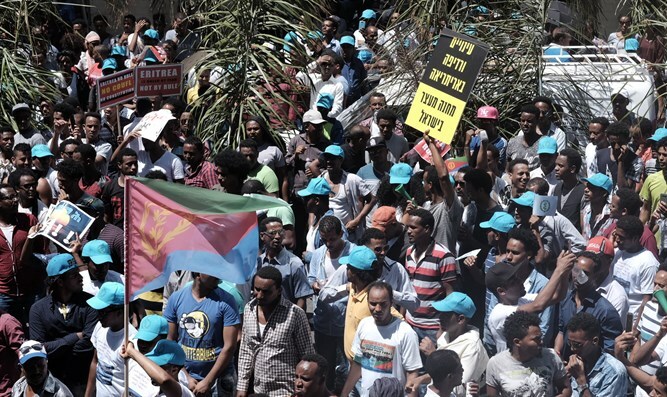 The desire of Eritrean men to evade unlimited military service is what causes many of them to flee the country and enter Israel, where Eritreans have been flooding southern Tel Aviv in recent years. Education Minister Naftali Bennett responded to the report and said that "the significance is dramatic - there is no longer even a claim that they are refugees," and therefore the illegal infiltrators who reside in Israel must return home, as he put it. Former Interior Minister Gideon Sa'ar tweeted following the report, "There is peace, there is security, all the reasons to go home." Shefi Paz, one of the leaders of the campaign to deport illegal infiltrators from Israel, said in response: "The excuses are over. They are going home. To mom and dad and the children they left there."